Before I start sharing my experiences with the many WonderSwan and WonderSwan Color games already in my collection, I thought I should say a few words about the WonderSwan system. 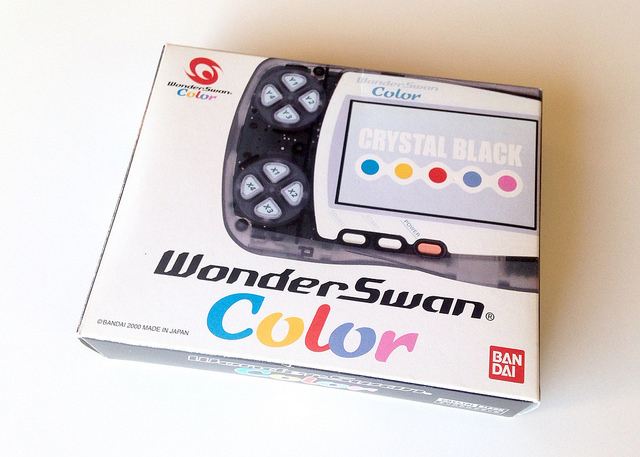 What I can talk about here: the WonderSwan Color system. It made its debut (in Japan, of course) in late 2000--just a year and a half after Bandai shipped the original model of its GameBoy Color competitor. 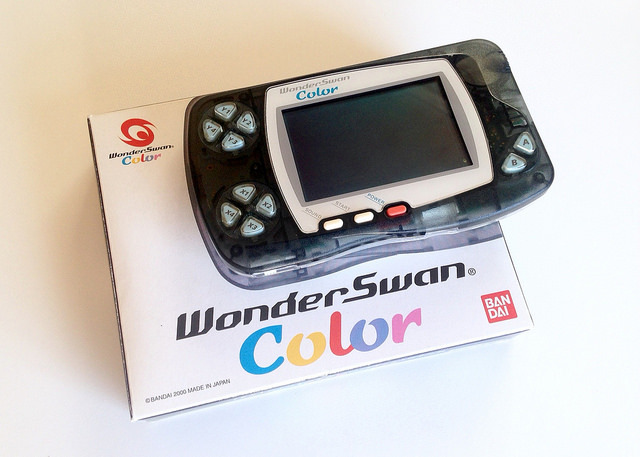 As its name implies, the WonderSwan Color added a color screen to the mix. That screen is a tad larger than the one built into the original WonderSwan, by the way--2.9 inches (diagonally) compared to about 2.5 inches. Actually, the WonderSwan Color hardware as a whole is a bit bigger than that of its predecessor as well. I can't pass along the exact dimensions of either system right now, but the WonderSwan Color is approximately the same size as two iPhone 5Cs stacked on top of each other. Besides that, the WonderSwan Color is powered by a single AA battery (which allows for around 20 hours of play) and, mostly importantly and intriguingly, offers users a bevy of buttons and control inputs. The most curious of those input options are the pair of split directional pads situated along the left side of the system. To be honest, I have a feeling they're not really split d-pads. Instead, they're probably just buttons arranged to look like and simulate a pad. Regardless, you use them to control movement while playing WonderSwan games (and quite adroitly, I might add), so I guess it doesn't matter if they're really split directional pads or not. Now, you can't just switch between the two willy-nilly. Most games stick to one orientation for the entirety of the experience, with the majority forcing you to hold your WonderSwan horizontally, like a GameBoy Advance, PSP or Vita. Don't fret if the ability to play handheld games vertically has you excited, though; a good number of WonderSwan titles require you to hold your system in that position. (A handful of examples from my own collection: Puzzle Bobble, Rainbow Islands: Putty's Party and Tane wo Maku Tori.) Also, a select few--including Kaze no Klonoa: Midnight Museum and Makaimura--incorporate both orientations into their gameplay. Still, experiencing portable games in this manner is such a breath of fresh air that I think it's worth dealing with the occasional hand cramp it's bound to cause. This may not sound so bad if you've never tried playing a handheld without a backlit (or frontlit) screen, but believe me, it can be a challenge. I often feel like I have to squint to see what's going on even in perfect lighting. Given that, I can't exactly recommend everyone run out and buy a WonderSwan Color along with a pile of WonderSwan cartridges, as I imagine most people who are used to more modern portable gaming hardware will find it difficult to fully enjoy Bandai's offering. Before you do that, though, you may want to wait until I've written about a few of its games. Thankfully, I'm planning to publish "Welcome to WonderSwan World" posts about a slew of titles--such as Clock Tower, Engacho!, Puzzle Bobble and Rainbow Islands: Putty's Party--over the next couple of weeks.